It will be the most powerful particle collider on the planet. And Iowa State University physicists will be right there working with it. The European Laboratory for Particle Physics in Geneva, Switzerland, is building the Large Hadron Collider, a new particle accelerator that will collide beams of protons or lead nuclei at close to the speed of light. The collider is expected to create as many as 800 million particle collisions every second. And those collisions are expected to recreate the conditions that existed just after the Big Bang began the rapid expansion and cooling of matter that scientists believe created the universe. The collisions are expected to create new particles that may help scientists answer basic questions about the universe. Data from the collisions may, for example, explain why matter has mass and how particles acquire mass. The Large Hadron Collider is being built in a tunnel nearly 17 miles around that crosses the French-Swiss border near Geneva. 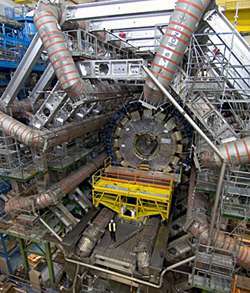 The collider is expected to be turned on for a pilot run during the summer of 2007. "Iowa State is a player at the cutting edge of research in these facilities at the forefront of physics," said Eli Rosenberg, professor and chair of Iowa State's department of physics and astronomy and the leader of Iowa State's high-energy physics research team. "We play an important role in these experiments." Iowa State's research team at the Large Hadron Collider includes Rosenberg; H. Bert Crawley, a professor of physics and astronomy; James Cochran, an associate professor of physics and astronomy; Soeren Prell, an assistant professor of physics and astronomy; and W. Thomas Meyer, an adjunct research professor of physics and astronomy. Fredrik Tegenfeldt, a postdoctoral research associate, is stationed at the European Laboratory for Particle Physics. And Nathan Triplett, a graduate student in physics and astronomy, will spend this summer at the European laboratory. This Iowa State team is working on detector design and physics studies related to the Large Hadron Collider's ATLAS detector, an instrument 50 yards long and 24 yards high that will track and measure particle collisions. The research team plans to study proton-proton collisions at the highest energies in the world. In addition, members of the department's experimental nuclear physics group -- John Hill, a professor of physics and astronomy; Marzia Rosati, an associate professor of physics and astronomy; and Alexandre Lebedev, an assistant scientist -- are planning to use the ATLAS detector to study the collisions of lead nuclei. John Hauptman, a professor of physics and astronomy, is also working on the Large Hadron Collider's Compact Muon Solenoid, the collider's other large, all-purpose particle detector. Iowa State's work in experimental and theoretical high-energy physics is supported by a six-year grant of nearly $6.9 million from the U.S. Department of Energy. The grant continues a tradition of high-energy physics work at Iowa State and the U.S. Department of Energy's Ames Laboratory on the Iowa State campus that dates back to 1963. One of the goals of the research at the Large Hadron Collider's ATLAS detector is to find evidence of the Higgs boson, a particle predicted by the Standard Model of particle physics. The model theorizes that space is filled with a Higgs field and particles acquire their masses by interacting with the field. No experiment has detected the Higgs particle. But researchers at the Large Hadron Collider hope their experiments make this discovery. "This is basic research that goes back to the question, 'What is the world made of?'" Rosenberg said. "We're trying to figure that out."